I think it is finally safe to say that it is officially feeling like Spring here in North Carolina! The dogwoods and azaleas are starting to bloom and the temperature is warming up. Spring is definitely my favorite season here in the South, there are so many wonderful things to enjoy. What do y'all love most about Spring? 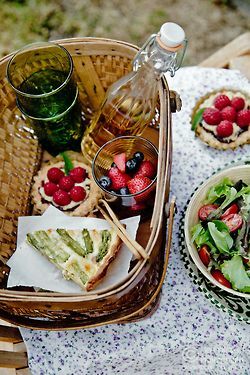 that picnic image is just gorgeous! I love every single one of these... including YOU, doll face!! Loving our twin posts today as well :) Happy Wednesday! Those pastel tulips ARE TO DIE FOR. So. beautiful. Cocktails outside, picnics outside, & walks together in the park are some loves... I am so excited that Spring is finally here!